Stripping baskets are box-shaped plastic tubs that strap around your waist and store loose fly line between casts. Most baskets are rigged with line tenders (small pegs or inverted cones) in the bottom to prevent wind and water from jostling and tangling the line. The line tenders also prevent tangles from forming when the fly line is shot from the basket at high speeds. Stripping baskets seem cumbersome at first but they enable anglers manage loose line and make smoother longer casts, and once you get used to them, it’s hard to go without one. 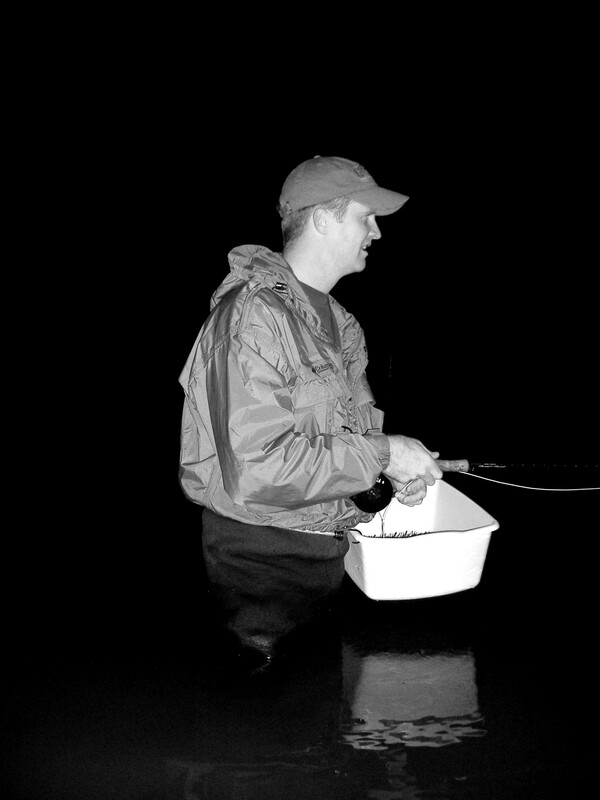 The original stripping baskets were made from Rubbermaid dishtubs lashed around the angler’s waist by a bungee cord. These baskets were used primarily by striper anglers who fished the rocky shorelines and jetties of the East Coast. The dishtubs kept their fly lines off the rocks and out of the currents and made it possible to shoot long casts. They were also a good fit for the hand-over-hand retrieving style needed for stripers and other nearshore species. The dishtubs were goofy looking but they worked extremely well. In Texas, stripping baskets have been slow to catch on. It’s too bad because almost any fly casting scenario is made easier by using one. Whether an angler is casting on jetties, flats, surf, from the bank or off a rocking boat, distance is improved and line management is simplified with a basket. Stripping baskets are made commercially and cost anywhere from 25 to 50 bucks. But, with a few inexpensive materials and basic tools, you can make a very good one that will last for many years and perform as well or better than any of the models you can buy. With that said, let’s get down to making a stripping basket. First, you’ll need a dishtub. Department stores usually carry plastic dishtubs manufactured by either Sterlite or Rubbermaid. There are typically two sizes- a shallow version and a deep version. Get the deep one. The deep tub keeps the wind out and allows more freedom of movement for your hands. If you get the Sterlite, make sure it is a white one. The white plastic contains softeners that allow you to drill through it without cracking. White is also a good color choice because it reflects light at night and makes fumbling with your tackle a bit easier. The Rubbermaid versions are usually called “Roughneck” tubs. Get the one that is about the size of a large shoebox. 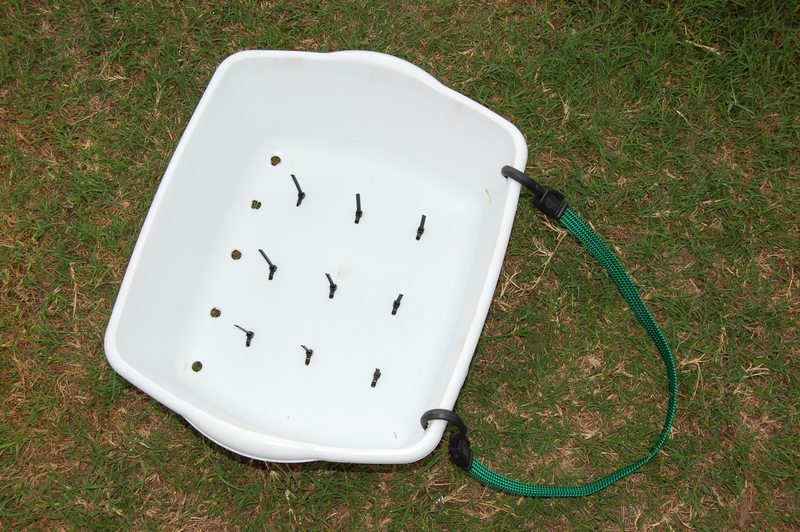 These tubs are all soft plastic and can be safely drilled. You’ll also need some plastic cable ties to make the line tenders. Get a small pack of the black 7” UV ties (you’ll only need 9 of them). You’ll be cutting them down, but the thickness of these ties provides the right amount of flex to smoothly feed the fly line when you shoot it. The belt for your stripping basket will be made from a bungee cord. I like the flat cords with the smooth plastic hooks. You can find these in auto parts stores or the auto parts section of department stores. If you prefer, you can also used a webbed nylon belt. I’ve used both but prefer the bungee. The good thing about a bungee cord instead of a webbed nylon belt is that it is elastic and allows the basket to be quickly moved to nearly any position regardless of what you are wearing. Bungee belts creep and slide less than a webbed belt, are less abrasive and the hooks on a bungee cord can be quickly grabbed and released in the event you need to make an emergency bail-out from the basket in swift currents. The last 2 items you need are drill bits. You will need a ½ inch drill bit and a 3/16 inch bit. Make sure the bits are sharp or you will tear or crack the plastic tub when you try to drill it. Begin by making 9 pairs of 3/16 inch holes, evenly spaced across the bottom of the tub. The distance between the centers of the pairs of holes should be about ½ inch. Once you have drilled these holes, string a single cable tie through each of the 9 pairs of holes. 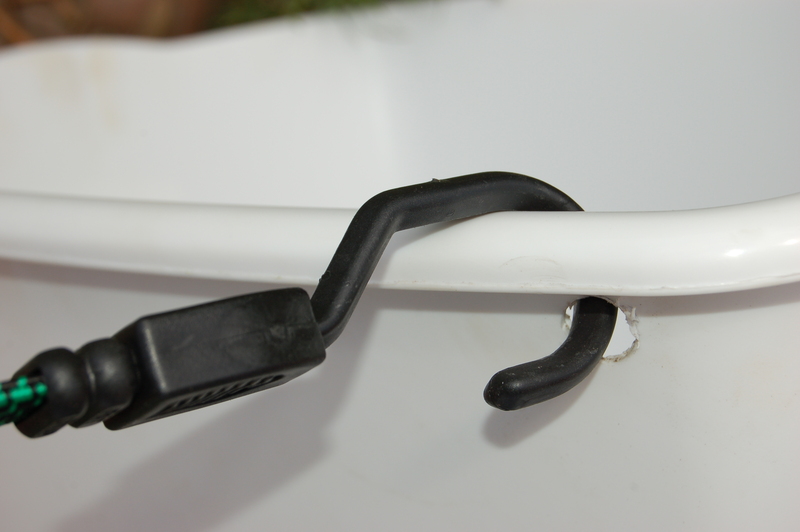 Push the tip of the cable tie through the hole, starting on the inside of the tub. The cable tie should run out the bottom and back up through the matching hole. The cable should be strung so that both the tip and the clasp end up on the inside surface of the bottom of the tub. Thread the tip of the cable tie through the tie clasp and cinch it down tightly. The flat side of the clasp should seat firmly on bottom of the tub and the tapered end of the tie should be pointing straight up from the bottom of the tub. After all nine cable ties are strung, snip each tie approximately 2 inches above the bottom of the tub. Smooth any sharp edges on the snipped ties with heat from a lighter, but be sure not to melt a “bulb” into the end of the cables. The tips of the ties should be smooth. Next, drill two ½ holes (one on each corner) through the top inside edge of the tub just below the lip. Each hole should be approximately 1 inch in from the corners of the tub and slightly below the flared lip. These holes will accommodate the hooks on either end of the bungee cord belt. If you elect to use a webbed belt, cut 2 slits in the side of the tub and thread the webbing through them. 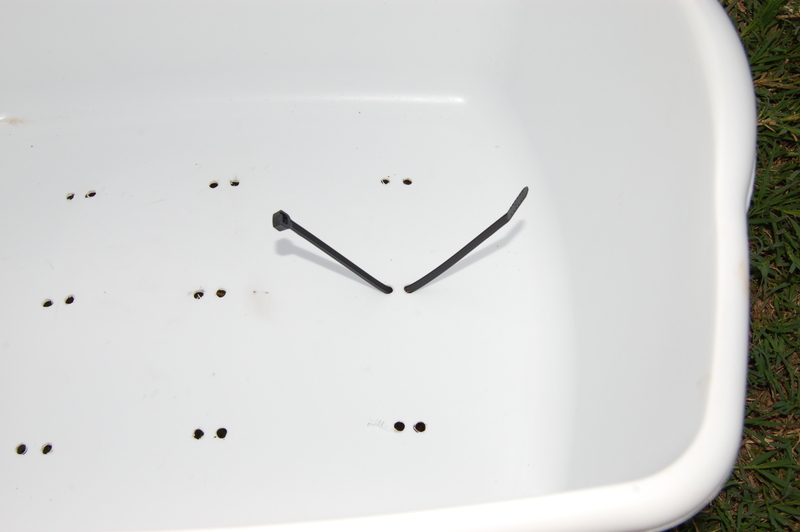 Lastly, drill four ½ inch drain holes in the bottom of the tub along the front edge. These holes will allow accumulated water to drain from the tub away from your body. Position the completed stripping basket near your hip just below where your stripping hand comfortably drops loose line. As you strip in your fly line, let it drop in the basket. When your line is fully retrieved, make several false casts and then shoot a long cast. As the line zings out of the bucket, feed it to the stripping eye on your fly rod by making a large loop between your index finger and your thumb. This keeps the line flowing smoothly. 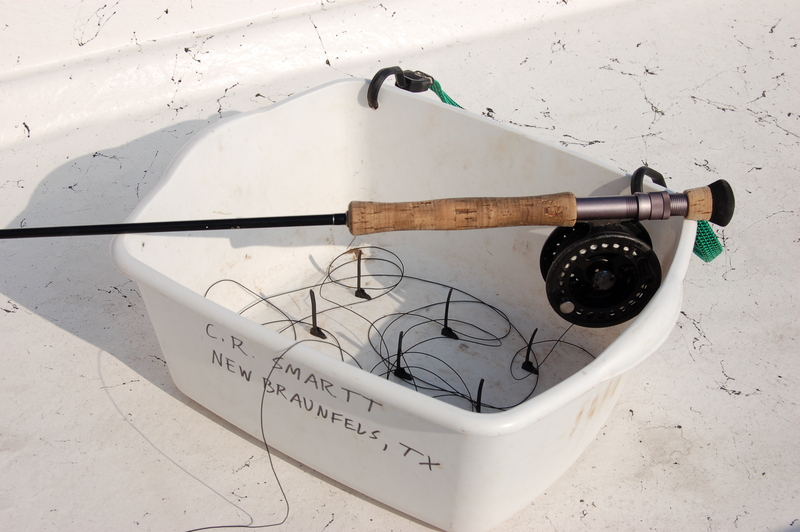 It takes a bit of practice, but if you stick with it I’ll wager that using this basket will eliminate your tangled lines, add distance to your cast, and improve your success on the water. Thank you for an easy fix to my line management problem. I am going to make a stripping basket just as you have shown.